British monarch, Queen Elizabeth the second has commiserated with the Crown Prince and the people of Benin Kingdom on the death of the Benin monarch, Oba Erediauwa. In a letter to Crown Prince, Eheneden Erediauwa made available to Channels Television, the British High Commissioner to Nigeria, Mr. Paul Arkwright, on behalf of the queen and the government as well as the people of the United Kingdom, extended his condolences. “As we mourn his passage, we take solace in the knowledge that his reign was peaceful and witnessed a strengthening of the relationship and good friendship between the people of Benin Kingdom and the UK”, he said. The Edo State Government had issued a statement announcing the death of the Oba of Benin in April 2016. The statement, however, did not say when and how the monarch died. “Our hearts are heavy, laden with pains and grief, at the announcement of the passing on to glory of Omo n’Oba n’Edo Uku Akpolokpolo, Oba Erediauwa of Benin, our highly revered Oba, a distinguished Edo numero uno, an accomplished Nigerian, a seasoned bureaucrat, quintessential unifier, unique personage and exemplary Omo N’Oba, whose reign brought distinction, immense class, finesse and integrity to traditional institution in Edo state and the country at large. “His carriage comes with an élan that was peculiar with the reverence of royalty. His uncommon courage was symbolic of the can-do spirit of the Edo mind. His unity of purpose was not in doubt even as he used his revered position to promote constructive engagement amongst all shades of opinion and culture in Edo state. “As a thorough-bred bureaucrat, rising to the pinnacle of his career as a Federal Permanent Secretary, he understood the dynamics and intricacies of governance. He was the alternative voice to the many voiceless in our society, calling government attention to issues of development and transparent governance, without minding whose ox is gored. He was brave, fearless, punchy and instructive in his verbal and written messages. “To us at the Edo state Government, he was our strongest supporter; both in his uncommon faith in our ability and his readiness to offer uncommon advice to sharpen public discourse in our shared commitment to transform Edo state. It gladdens our heart, therefore, that our revered Oba was alive to witness the positive transformation of Edo state under his reign, and for standing with us through thick and thin in the course of making the Edo economy a treasure to behold. Being part of that eloquent history of transformation before his reunion with his ancestors gives us further reassurance that he will occupy a special pride of place in the hereafter. “We are enveloped with a deep sense of nostalgia that our great Oba, a great-grandfather, grandfather, father, uncle and iconoclastic royal father of exemplary carriage and conduct, who sustained the dignity of the average Edo mind, has joined his ancestors. We are, however, encouraged by the fact that another great son of the Great Benin Kingdom, His Royal Highness, Edaiken N’Uselu, Crown Prince Eheneden Erediauwa, who is already showing manifest quintessential attributes of his great father, will step into his father’s big shoes. 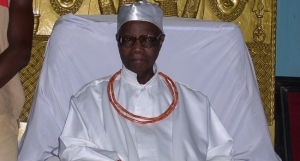 “Edo people will miss our iconoclastic royal father of the great Benin Kingdom. Nigerians and Nigeria will miss this great exemplar of a Royal Father, an Oba of distinction and integrity. Adieu until we meet to part no more. “Oba gha to kpere, ise.